Today was a momentous day in 1944, as popular Brewer manager Charlie Grimm officially stepped down from his post in the Borchert Field dugout to take the vacated Chicago Cubs managerial job. But never fear, Brewer fans, Jolly Cholly wouldn't leave without a carefully-chosen successor in place. 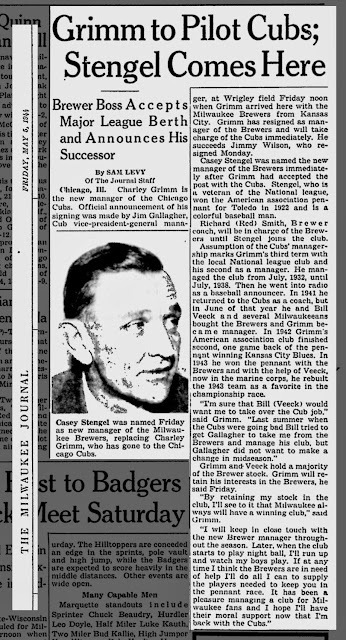 Grimm chose Casey Stengel to take over. Stengel is well-known to modern baseball fans; he led the New York Yankees to seven World Championships between 1949 and 1958, gave the expansion New York Mets instant credibility, and had his number #37 retired by both clubs. After retiring from managing after the 1965 season, Stengel was elected to the Baseball Hall of Fame. He is widely considered one of the greatest managers the game has ever produced. But that was all in his future. In 1944, Casey Stengel was seen as washed-up, a has-been coming off two failed managerial stints. He had been skipper of the Brooklyn Dodgers and Boston Braves for a total of eleven seasons, never finishing higher than fifth place with either club (this in eight-team leagues). Hardly the big name Milwaukee fans wanted to see take over their first-place Brewers. Grimm recognized something in Stengel, though, and chose him to safeguard Grimm's investment in Milwaukee. How well the Old Perfessor would do with it, well, we'll see soon enough.